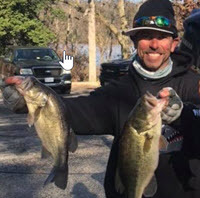 Becky and I got back from vacation last Saturday and I decided to fish a Winter League tournament up here on Sunday. The air temperature was really cold and the water was in the low 40s. The bite was tough. Nevertheless, we won with four bites that put four bass in the livewell. They weighed 6.86 pounds. We used what’s probably my favorite winter bass lure — a hard jerkbait. But, we didn’t fish with just any jerkbait. We spent a lot of time matching size and figuring out how we wanted the bait to act on the pause. We had to determine if the bass wanted it to suspend at one depth, rise on the pause or fall on the pause. And, of course, we also had to vary our retrieve until we found what was working best on that particular day. We noticed right away that the dead shad we saw floating on the surface were really small so we reached for a Rapala RipStop. The No. 9 is 3-1/2 inches long which was perfect for what we were doing. It comes in at least 14 colors so matching the hatch was no problem. Out of the box the RipStop is a true suspending bait. It’ll sit still at one depth forever. But it’s easy to make into a slow float or a slow sink model. All you have to do is change the size of the hooks and maybe add a split ring, or take one off, to make it do what you want it to do. Swapping line around will help, too. We found out pretty quick that they wanted it to suspend so we fished ours just like it comes from the package. If we needed a big jerkbait, we’d have fished the Rapala Shadow Rap. It’s 4-1/4 inches long and comes in even more colors. Out of the box this one is a slow falling bait. But, like the RipStop you can change that with a quick swap of the hooks, a split ring and a change of line. In between the long and the short is the Shadow Rap Shad. It’s 3-1/2 inches long but it’s a little heavier at 3/8 of an ounce than the RipStop which only weighs a 1/4 ounce. This one rises on the pause when it’s fished the way Rapala makes it but, like both of the others, it can be customized in just a couple of minutes. Both the Shadow Rap and the Shadow Rap Shad come in deep diving versions as well the standard, more shallow depth versions. They’re the same except for the depth thing. The third factor with jerkbaits is the cadence of the retrieve. I usually start with a short, soft pull and a pause of about 5 seconds. If, after 10 or 15 casts I don’t get a bite I start changing things around. The day of the tournament long, slow pulls and long pauses of about 15 seconds seemed to work the best for us. Tackle is critically important when you’re fishing hard jerkbaits, and that starts with the right rod. 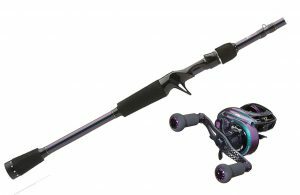 My choice whenever I’m twitching along is an Abu Garcia Ike Delay Series Casting Rod. For the RipStop we were fishing I used a 6 foot, 4 inch medium action model. The short handle and the parabolic action of the blank let me work the bait exactly like I wanted. And the shorter length doesn’t move the bait as far on a twitch as a longer rod would. My reel was an Abu Garcia REVO IKE Casting Reel, 6.6:1 gear ratio. I don’t like high-speed reels when I’m jerkbait fishing. The lower gears help me slow down. I spooled my reel with either Berkley Trilene 100% Fluorocarbon or with Berkley Trilene Sensation monofilament. I swapped them around and changed the test weight of each to help me control the rate of fall or rise of the bait. Think about size first. Then think about the bait’s propensity to rise, sink or hold steady and adjust it as necessary. Finally think about cadence. After you get all that figured out it’s just a matter of winding them in to the boat. Ha!